Normally at this point of the festival I’m starting to wish I wasn’t sitting in a darkened room surrounded by spluttering, deep-breathing people eating their own weight in popcorn or nachos. “Hell is other people”, Sartre once said. I can only imagine these words popped into his head when he was sat in a cinema next to two old people gassing on about their day after he shelled out good money to be entertained for a couple of hours. That being said (the festival ain’t over yet, mind), the number of imbeciles is noticeably down on previous years, while the amount of food being carted into the screenings I’ve attended is on the wane. This pleasant fact mixed nicely with the two fantastic documentaries I managed to catch. Since winning his Oscar for 1991’s Silence of the Lambs, director Jonathan Demme has, with a couple of exceptions (most notably the Tom Hanks-starring Philadelphia (1993)), stepped away from the spotlight. Demme has now become more of a documentary film-maker than anything else and, following his two concert films with Neil Young and his acclaimed portrait of ex-US President Jimmy Carter, he returns with I’m Carolyn Parker. 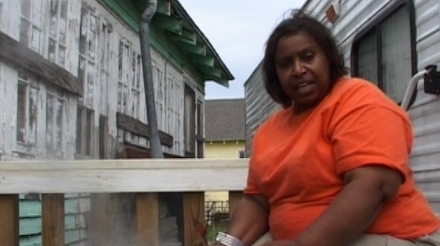 I’m Carolyn Parker marks a return to post-Hurricane Katrina New Orleans for Demme following his 2007 TV mini-series New Home Movies From the Lower 9th Ward. The plight of the residents of New Orleans after that devastating storm in 2005 which led to great swathes of the city being flooded and the deaths of more than 1,800 people, is clearly something close to Demme’s heart. He’s not the first film-maker to cover the subject; Spike Lee’s When the Levees Broke (2006) was widely considered a documentary milestone. However, the ace up Demme’s sleeve is the main subject of his film – Carolyn Parker. The film opens with friends of Mrs Parker praising her to the hilt, pointing out that she was one of the very last to leave the Lower 9th ward, one of the worst hit areas of the city, and among the first to return after the storm waters subsided. In Demme’s eyes, Mrs Parker is a symbol of the Lower 9th itself, a determined, resourceful person who doesn’t abide politicians or church leaders if she doesn’t feel they have the community’s best interests at heart. Demme first meets her in 2006 – her house is a wreck but she, and those nearest and dearest to her aren’t going anywhere and begin their fight to see the house, the beating heart that keeps her going, brought back to its former state. Little did Mrs Parker, and Demme it’s pretty safe to say, think it would take another four years before this dream could finally be realised. During this time, the director and his small crew return time and again to check on her progress and, while putting a brave face on it, it’s clear to see the struggle has taken its tole. Snatches of footage of Mrs Parker sat in church, surrounded by people singing and looking happy, see a woman lost in her thoughts and without the smile that’s otherwise there for the cameras. Crystallising a massive, devastating event into one person’s plight is hardly original, but then none of those films had Mrs Carolyn Parker in them and Demme should be congratulated for getting this inspirational woman’s story out into the world. Another inspirational story, albeit of a very different nature entirely is told in Alex Gibney’s fantastic new documentary Magic Trip. Gibney has become one of America’s most important documentary film-makers in recent years, from Enron: The Smartest Guys in the Room (2005), to Taxi to the Dark Side (2007), his searing examination of the US’s policy of torture post 9/11, and Client 9: The Rise and Fall of Elliot Spitzer (2010). 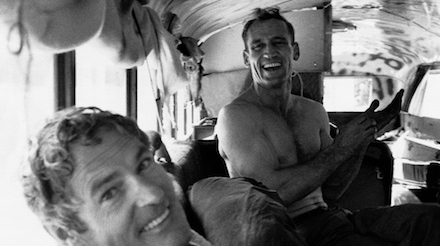 Gibney and co-director Alison Ellwood worked with three archival institutions to put together the hours of raw footage filmed by Ken Kesey and his Merry Band of Pranksters as they journeyed across America in 1964 in a clapped out old school bus they named ‘Further’ to attend the World’s Fair in New York. Greatly inspired by Jack Kerouac’s generation-defining book On the Road, Kesey had already achieved national attention for his classic novel One Flew Over the Cuckoo’s Nest and, with John F Kennedy’s assassination still locked in people’s minds and nuclear annihilation an ever-looming threat , he wanted to turn his back on the present and see what the future had in store. To this end he and a group of friends embarked on a cross-country road trip from California to New York and back again, laden down with barrel loads of LSD and a mischievous, free-wheeling spirit to match. It was fitting they were joined on the way to NYC by the real-life Dean Moriarty, the one and the same from Kerouac’s On the Road, who drove the bus. Although certain they were making waves, little did they know their trip would effectively instigate the counter-culture and become the stuff of legend thanks to Tom Wolfe’s book The Electric Kool-Aid Acid Test. Using archive footage shot on the road by Kesey and the Pranksters, Gibney and Ellwood have assembled a fascinating chronicle of a key moment in America’s history. Eschewing the standard way these kinds of historical documentaries are put together (experts offering pearls of wisdom), Magic Trip contains no talking heads. In fact the only nod to the present day is a slightly fruity narration by Stanley Tucci, although even this is done in such a way as to make it sound as if the narrator is embedded with the gang, with Tucci asking questions of the Pranksters who reply giving us on the road reportage. Featuring a great soundtrack of early-Sixties classics, including The Grateful Dead (which is appropriate, as they joined the fun with the Pranksters), Gibney and Ellwood have managed to do what Kesey and co were unable to for so many years – to bring sense to a crazy time while still capturing the whacked-out spirit of a lost generation.